Litronix, Inc., (Cupertino, CA) was an early light-emitting diode (LED) company that became a leading supplier of displays for handheld calculators and digital watches (e.g. the Hamilton Pulsar line). This rare Checkmate was the first portable electronic calculator developed and manufactured by Litronix It is one of the rare designs using the original Klixon™ keypad without the TMS0100 MOS/LSI calculator-on-a-chip. The printed circuti board (PCB) of the Checkmate is centered around a LIT-019 calculator circuit, discrete display drivers (the two white ceramic housings are current limiting resistors manufactured by Beckman), and three Litronix display modules with 3 digits each. Maybe you noticed already the unusual lettering of the decimal switch above the [-=] key. Instead the usual 0-2 selection it gives a 2-4 selection. 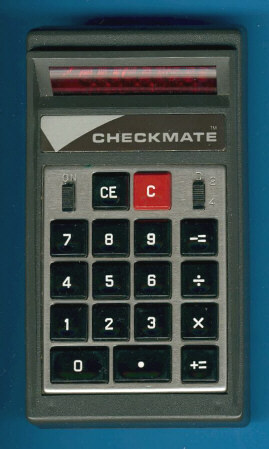 The Checkmate is one of the few portable calculators without floating point operation. The Checkmate was later replaced with the Checkmate 1002 assembled in Malaysia.